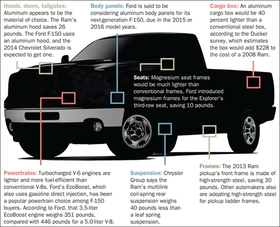 Can a full-sized pickup go on a diet and lose about 800 pounds? It's a challenge, says Richard Schultz, managing director of Ducker Worldwide in suburban Detroit, but it's feasible by 2020 and would help automakers achieve rising fuel-economy targets. An average fullsized pickup weighs about 5,000 pounds, he says. To shed the weight, the trucks would get more aluminum and magnesium components, Schultz says. In a survey last year, he listed strategies that could cut weight from a full-sized pickup — in this case a 2008 Ram — without dramatically downsizing the vehicle or hurting its performance. Here are some of those strategies, along with several steps taken by automakers.